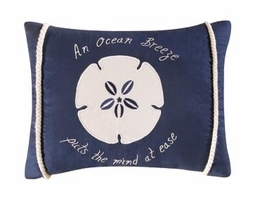 Bring back lzay days at the beach with this Ocean Breeze saying Pillow. Deep navy blue background displays a large white fabric appliqued sand dollar with an embroidered saying: "An Ocean Breeze...puts the mind at ease", and trimmed with nautical cording. Great for the beach house, boat, or any tropical-themed bedroom! Measures 12 x 16 in.